Something big was happening with Patrick Mahomes. All those visits and workouts with teams. The buzz around each trip. The signs were all there. And they turned out to be right. Mahomes completed his surprising ascent in the NFL draft Thursday when the Kansas City Chiefs selected the former Texas Tech quarterback 10th overall. The second of only three quarterbacks chosen in the first round — North Carolina’s Mitchell Trubisky went second overall to the Chicago Bears, and Clemson standout Deshaun Watson went 12th to the Houston Texans — Mahomes wound up with the Chiefs after they paid a steep price to move up the board for the rawest high-profile player available at the position. Even Mahomes acknowledges he has a whole lot to learn about playing under center, how to protect the football and the complexities of running a traditional NFL offense. But the Chiefs are also getting an athletic passer who possesses outstanding arm strength, as well as someone who understands what it takes to truly succeed in professional sports. Mahomes’ father, Pat, and his godfather, LaTroy Hawkins, are former Major League pitchers. As a child, Patrick, also a former pitcher whose fastball has been clocked at 96 mph, had an up-close view of baseball All-Stars at work. After a record-setting college football career, he hopes to become an all-time great in the sport he loves most. The Chiefs validated Mahomes’ decision to give up baseball. During the opening round of the three-day draft in Philadelphia, Kansas City swapped positions with the Buffalo Bills, moving from 27th to 10th. To persuade the Bills to make the deal, the Chiefs also gave up their pick in the third round (91st overall) and a 2018 first-rounder. Obviously, Kansas City coach Andy Reid liked what he saw in Mahomes and didn’t want to risk losing him. Based on the chatter around the league the past few weeks, Reid had reason to be concerned. 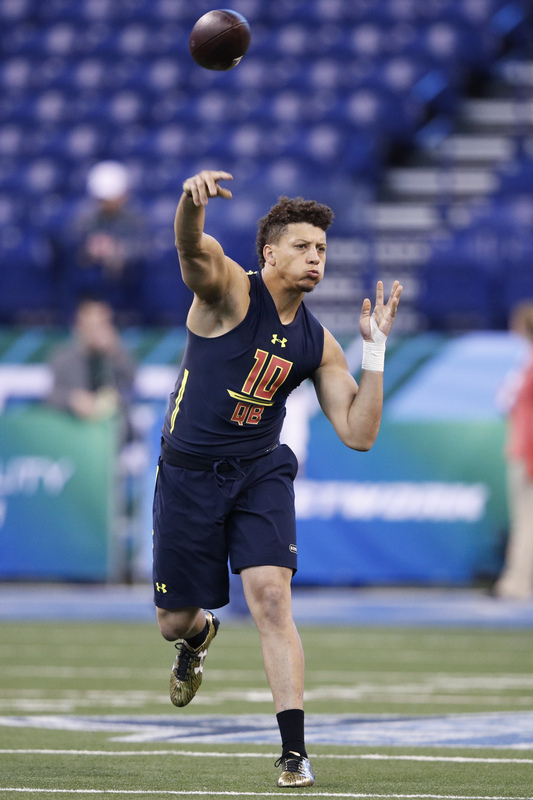 Quarterback Patrick Mahomes of Texas Tech in action during day four of the NFL Combine at Lucas Oil Stadium on March 4, 2017, in Indianapolis. Before every draft, there are players whose stock rises quickly based on their performances in private workouts and how they come across in interviews with team decision-makers. In the run-up to this draft, Mahomes was that dude. The past couple of weeks, more and more clubs were trying to get on his schedule. Mahomes bounced around the country like a rock star on tour, improving his standing with each stop. Mahomes figured to be the first African-American quarterback drafted “because he has the strongest arm,” one NFC East player-personnel official said before the draft. “There are other guys who can make all the throws … but his arm strength is the difference. He needs the right fit. And getting a chance to sit and learn is going to be important because of where he’s coming from and everything he’ll have to do differently” in the NFL. At Texas Tech, Mahomes posted stats worthy of a video game. He led the Football Bowl Subdivision (FBS) with 5,052 passing yards last season, joining Tennessee Titans QB Marcus Mariota, who played collegiately at Oregon, as the only players from a major conference in FBS history to throw 40 touchdown passes and rush for 10 touchdowns in the same season. And then there was the Red Raiders’ 66-59 loss to the Oklahoma Sooners last fall in which Mahomes racked up 734 passing yards with five touchdowns and 819 total yards — an FBS record. Here’s the thing, though: Many Texas Tech signal-callers have lit it up in the “Air Raid” offense, a gimmicky spread scheme that isn’t ideal for preparing quarterbacks to play in a pro-style system. Although NFL teams use spread elements and concepts, quarterbacks who have played in “Air Raid”-type schemes have not fared well at the next level. Mahomes intends to be the first. “It’s fair if they [critics] want to talk about what other guys have done or haven’t done. Those are facts. I can’t do anything about that,” Mahomes said. “But that’s also not me. If they want to talk about me, then they can watch my tape. Fortunately for Mahomes, it’s unlikely he’ll get a chance to do that anytime soon. He’s joining a Chiefs team that won last season’s AFC West title and has advanced to the playoffs in three of the past four seasons under Reid, who’s considered one of the game’s best coaches at developing quarterbacks and putting them in position to succeed. Steady veteran Alex Smith is firmly entrenched as the team’s No. 1 quarterback. Mahomes is in an ideal situation: Reid will groom him to eventually replace Smith without the pressure of having to produce immediately. For a young quarterback, it doesn’t get any better than that. Not that Mahomes intends to kick up his feet for the next couple of years. He plans to show Reid he’s all about work. Early on, he learned that’s the right way to do it. The Chiefs got Mahomes. They’re also hoping they’ve got their quarterback of the future. An earlier version of this story incorrectly stated that Deshaun Watson was the 13th overall pick.